I feel the need to share a secret. The College Search process is actually supposed to enjoyable. The College Search is a chance to visit new places, to explore new options and answer the Zen-like “whatdoyouwanttobewhenyougrowup” question. It’s a chance to choose what courses you want to take and where you want to take them. Most of my readers are from New Jersey. And, historically, New Jersey has a reputation as an “exporter” in the college student industry. But ignoring the options available in the Garden State is a big mistake. New Jersey has over 50 great colleges – 35 offering bachelor’s degrees and 19 community colleges. They come in all shapes, sizes, locations and styles. Treat the College Guides Like They Are Your Favorite Catalogs: It IS a shopping trip, you know. Flip through the college guides, search through the online search services, read the colleges’ viewbooks, watch the videos (maybe pop some popcorn for the viewing), and check out the Colleges’ websites and Facebook pages. Take Pictures: Be the tourist. Record your trip. (Just don’t embarrass your kid too much.) And it will help when you come back home and try to remember which school had the cool student center or residence halls (or horrendous parking lots or not-so-attractive surrounding neighborhood). Maybe, while in Hackettstown, you’ll catch a picture of Tilly, Centenary College’s (in)famous ghost. Take Notes: For most families I’ve talked to, the College trip (or trips) becomes a blurred memory. Keep a journal to help you remember what you liked and didn’t like about certain schools and preserve your memory (and your sanity). Read one of the “lighter” College Search Books: For every 400 page tome that lists thousands of colleges and millions of bits of data, there is a down-to-earth, light-hearted piece such as Risa Lewak’s “Don’t Stalk the Admissions Officer”. Grab one, read it and remember that this is not meant to feel like root canal. Remember, that’s it the Student’s Choice, Too: Your teenager may have a reach school, but your teenager is also somebody’s “reach student”. Don’t forget that your family is the consumer in this process. SO… Look at this as an exciting journey towards the future, not a dreaded confrontation with the evil world of Admissions Committees. Research. Apply. Review. But, most of all take a deep breath and…ENJOY! 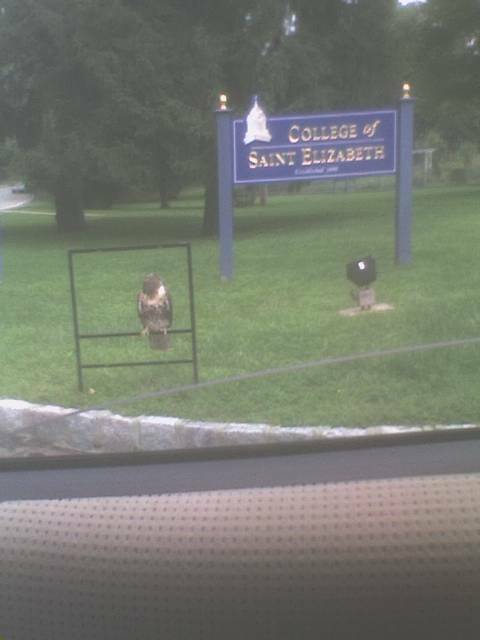 Photo of the hawk at the College of Saint Elizabeth is courtesy of yours truly as he rolled down the window of his Saturn and snapped the picture via cellphone, without crashing. I agree — have fun with the trip and make a good day of it. When Lucille and I took Stefanie to visit Rowan, we made sure to stop at the historic Harrison House for an early dinner, and s l o w l y drove through Mullica Hill’s antiquing area. Wehn Stef ane I visited William Paterson, I introduced her to my old hangout, Brother Bruno’s. And what’s NOT to see in Princeton. Insert the word “contribute” to the 2nd sentence of my reply. It will make a whole lot more sense. Sorry about that.